Former Miss America and Jesus/Tim Tebow fan, Gretchen Carlson, began by saying that, in spite of Jesus' team having been defeated on Sunday, "the Tim Tebow craze is just picking up steam." As she introduced the author of the Tebow book, the chyron assured us that sales of the book are "skyrocketing." With a great big grin, Gretch, who has interviewed Tebow, asked Nathan Whitaker if Tebow is as genuine as she believes him to be. Whitaker couldn't have been any more effusive about how awesome Tebow is. Gretch couldn't have been any more effusive in her commentary. As they spoke, photos of Tim, doing his trademark "Tebow" were shown, praise Jesus/Tim Tebow. Gatlin talked about how he respects Tebow for his faith and how he wants to meet Tebow in heaven. (Rather, ahem, presumptuous?) Gretch smiled benevolently as Gatlin worked in the trademark Fox persecuted Christian meme with his comment about how Tebow has been "shot at by the media." (Again, no examples). Setting the official Fox message, the chyron read, "A Real Role Model, Tebow A Good Influence In Sports World," Gatlin talked about how if it was acceptable forWashingtonto pray at Valley Forge, it's OK for Tebow to pray on the sidelines. Gretch launched into the agitprop when she asked what he thought about the criticism of Tebow who "does well" and "is a good guy." She reinforced the persecuted Christian meme when she asked "why the criticism about a guy who is simply a Christian." Whitaker didn't know the answer but does know that Tebow is a great role model and otherwise truly awesome. 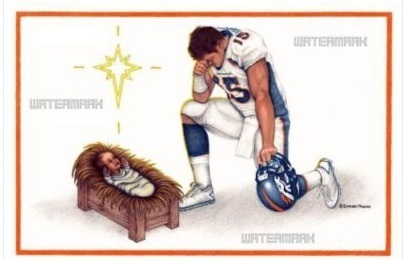 BTW, If you Tim Tebow fans want to send a special Christmas (not holiday, dammit) card while paying homage to Jesus and Tim Tebow, check out E-Bay where you can get this awesome card. The current bid is $75.00. It a limited edition and has been sold out from distributor. So gets yours now while they last! I was surprised that Mr. Gatlin offered up Carrie Underwood! Sorry for the double post. New system. I just paid attention to the sick card above. What a damn mockery of the Christianity of Jesus. The above is NOT Christianity. If I were a religious Christian, I would say it is blasphemous. What Tebow and Fox claim to be Christianity is not the only religion that says it is a Christian religion. Timmy’s superstitious Born Again mythology is a completely different religion from certain other branches of Christianity. Bet most of you genius News Hounders didn’t know that. Gretchen Carlson, like Sarah Palin, is as American as apple pie & as Christian as St. Cecilia. As a woman of faith, she naturally admires & supports Tim Tebow, as do all decent people. Gretchen makes me want to bleach my eyes. Teeboner’s in-your-face evangelicalism has always been annoying. Now that Jabba T. Ailes and Fux Noise have joined the crusade, it has become offensive.